A peaceful stunning elevated location. superbly positioned just 800m from the golden sun stretched beach of San Cristobel. Here you'll find a wonderful beach promenade lined with beachside tapas bars, shops and restaurants. The main town centre is just 10 -15 mins walk away oozing with traditional Spanish charm and character. Meandering cobbled paths lead to the vibrant town square packed with Spanish tapas bars , restaurants & shops a traditional fresh fish, vegetable markets. This spacious contemporary 3 bedroom Villa is fully air-conditioned throughout and also offer a large rooftop terrace and a small covered balcony terrace, dining area. The interior boasts a relaxing open plan lounge with modern furnishings. leather corner sofa, TV & DVD. music speakers and a wood burner fireplace. The fully fitted Kitchen is well stocked with modern cooking facilities & a breakfast bar. Just outside the kitchen area, there is also a covered patio with table and chairs and panoramic views. of the town. External stairs lead to a fabulous sun rooftop terrace with exceptional views across the mountains and the historical town of Almunecar, a beautiful private floodlit pool with subtle low lighting for the relaxing evening, Andulcian brick style BBQ, A full-size table tennis, hammock, dining area. & sun loungers. The roof-top terrace is a wonderfully spacious area of the house making it the most perfect place to spend lazy sunshine days with family or friends. The house also: offers a Secured entrance including intercom operated gate & parking. 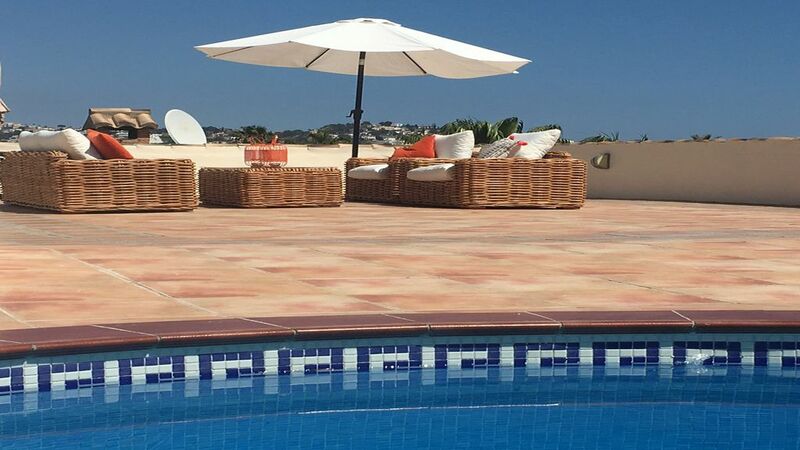 Fantastic roof-top sun terrace, with views of the distant mountains , side sea view & the town of Almunecar. Flood-lit pool and Andalucian style brick BBQ to while away the evenings Well maintained, spacious living interiors. Outside parking. Easy location to walk out to the beaches, tapas bars. Perfect for a chilled holiday! Large Family Bathroom with bath/separate double shower, wc En-suite Bathroom-Master bedroom with double shower, sink wc. Open plan lounge / kitchen contemporary style furnishings, Leather corner sofa, Wood burner, Television with some UK Channels, DVD and Stereo music system. Oven/Grill, Halogen hob, microwave. Kitchen leads to a covered terrace with table and seating for 6. Sierra Nevada-Ski resort is just over an hour & 20 mins drive. Facilities and slope management are truly first class, 1996 saw the World Championships staged at Sierra Nevada. With 40 miles of ski runs and two cross country circuits the resort is serviced by 2 cabin lifts, 12 chair lifts and 5 T-bars. Motril is 15 mins drive away and boasts a 18 hole golf course. There are several other good courses within a 30 mins drive. Smoking allowed ; Outside terrace only . Notes on accommodation: Suitable and safe for toddlers and young children. Stair gate rail available on request to seclude the pool area. Air-conditioning through-out. Shutters on all windows. Gated entrance with entry phone. Large roof terrace (great for children) Table tennis . Main bed (King-size). Smoking outdoors only please. TV . Outside: Large roof top terrace overlooking the fabulous views of Almunecar a delightful flood-lit private pool. Typical Andalucian style barbecue, sun loungers, Table Tennis. Comfortable table and chairs. Ground Floor. Outside parking area, secure entrance with intercom/alarm system. Pool Dimensions : Shallow end 90 depths, deep end 180 depth - Width 3.60 meters and the length is 9 meters. Utility Room: Washing Machine. Drying area. Iron & Ironing board. Cleaning / Towels / Linen / Maid service: Property cleaned before arrival with bed linen, towels Provided (excluding beach towels). Change of towels and linen weekly. Pool attendant -weekly. We had a lovely stay here. The house was lovely and well equipped - the roof terrace was a joy! Sharron was great with communication and very helpful. We had some lovely meals out in Almuñécar and the house is well positioned to make the most of the promenade. Local facilities are excellent - we found everything we needed close by. Thank you Sharron for the use of your wonderful property. We spent a lovely two week holiday in this comfortable villa . We made good use of both the terrace off of the kitchen and the roof terrace on a daily basis. The location was excellent being only a short walk to the seafront and beach with many bars and restaurants to choose from. We did hire a car for the second week but you can manage without one as it’s an easy walk to the supermarket or into town. The owner was very approachable and provided very comprehensive information about both the villa and the surrounding area. We did have cause to contact her on arrival but she responded quickly and resolved our problem. We had a lovely 2 week stay in June with our family (ages 19 to 61). Suited our purpose perfectly for a relaxing holiday. Weather was perfect and accommodation was perfectly adequate for our needs. Thank you for your kind review . Very pleased to hear you enjoyed your stay. Hope to see you agin sometime. Really great well equipped house with outstanding roof terrace with pool which we used every day even though early in year. (April/May) Very easy walking to bakery and supermarket just 5 mins down hill and easy 15 min stroll into town along sea front .... we had a car but only used it to go out of town. Many good restaurants and bars and we had special birthday meal at El Chaleco (5 min walk) which was exceptionally delicious and good value for that standard of food. Altogether great holiday with fantastic accommodation! we had a great holiday. Sharron was the perfect host in ensuring we had all the necessary details for every device in the villa, recommendations for hotels, bars and shopping. The villa is extremely comfortable and a real home from home - the roof top terrace is wonderful with great views out to sea, across the town and the mountains. The villa is spotlessly clean and very well equipped. Thank you Chris, I'm so glad you enjoyed my house . I think this little pocket of Spain is probably the only place left that still value for money in Europe. Thank you for looking after the place & being such wonderful guest too. We thoroughly enjoyed our time here. It lived up to the photos and the terrace was amazing. Sharon was so good keeping in touch even on Easter Sunday. We would definitely go back ! Thank you Sophia , its was a Pleasure to have you stay. and you're very welcome anytime. Driving distance - Nearest beach 2 minutes. Sierra Nevada- 1.30 minutes, Granada central 1.30 Hrs, Local water park - 5 minutes. Just a few minutes drive or a leisurely 15 minute stroll takes you into the heart of town. From once the old fishing village days of Laurie Lee, Almunecar has grown into an attractive town full of true Spanish flavour. The maze of narrow streets hosts a fusion of bars, restaurants and shops, where you can take a break in one of the many squares and enjoy the custom of free tapas served with drinks. The daily markets in Town are popular and renowned for its fresh fish and meat markets perfect for alfresco bbq. Granada and the Alhambra Palace are just over an hours drive away and the ski slopes of the Sierra Nevada just 20 minutes from there.